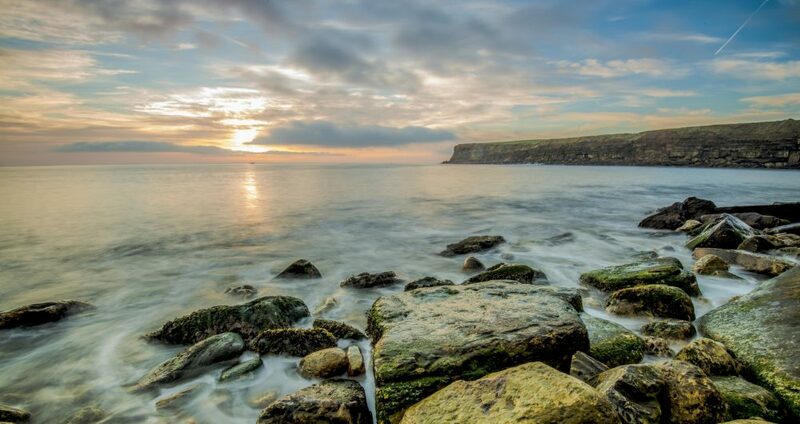 Here are our favourite beaches in Yorkshire. Whether you prefer a beautiful stone beach where you won’t be in danger of getting sand in your lunch, or a beach where you can dig a hole, build a sandcastle and and feel the sand between your toes… you’re in luck, because the coast of Yorkshire has everything you could wish for. The scenic Yorkshire coastline means that during those summer months when you can enjoy the beaches to their fullest, it feels like you could be anywhere in the world! The British seaside is a truly unique place. There are few places in the world where you’ll find better Fish & Chips, plenty of entertainment and of course, the wonderful phenomenon that is the arcade! In Yorkshire, you’ll find beaches of all kinds, from the secluded to some of the most visited holiday destinations in the country! Whitby is found in North Yorkshire and is perhaps best known globally for being the British home of none other than Bram Stoker’s Dracula. 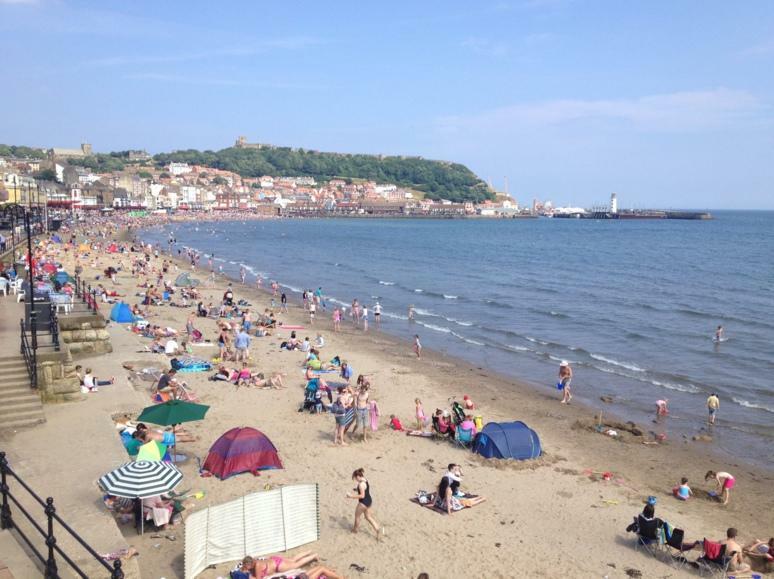 Whitby features beaches which can be found either side of the River Ask. Here you’ll find a couple of delightful beaches, with traditional changing huts running colourfully down the adjacent pavement. Simon and Garfunkel sang about the fair way back in 1966, however they could’ve equally focused on the nearby beach, which is one of the busiest beaches in Yorkshire, if not the entire of the UK. Scarborough is a wonderful place, consisting of all the trappings of the traditional English seaside resort. Near the beaches you’ll find an abundance of treats, including more Fish & Chip restaurants than you can shake a stick at! Bridlington, or “Brid” as it’s lovingly referred to by many Yorkshire folk, is a beautiful seaside town, well known for the wonderful walks it offers and the significant history of the area. 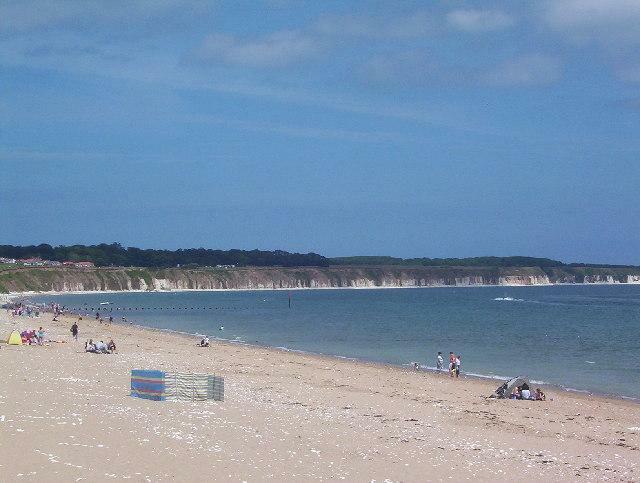 Many people from Yorkshire will have fond memories of spending their weekends in Bridlington, enjoying the beautiful (and often busy) beach when the weather is good. 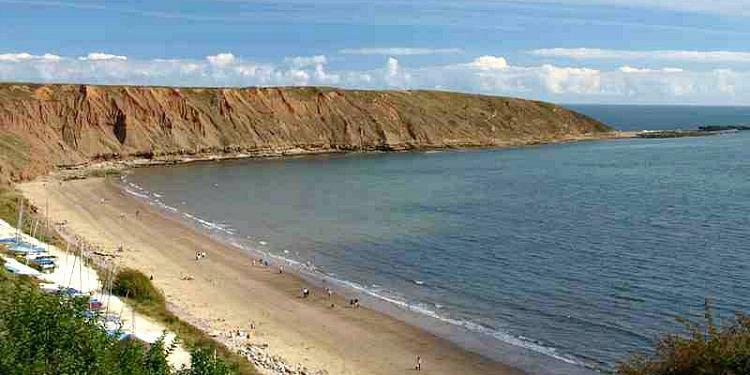 Filey beach is an exceptional place which is particularly popular with families. The beach itself is beautiful all year round. It is perfect for walks with the dog in winter and it really comes alive in the height of summer. 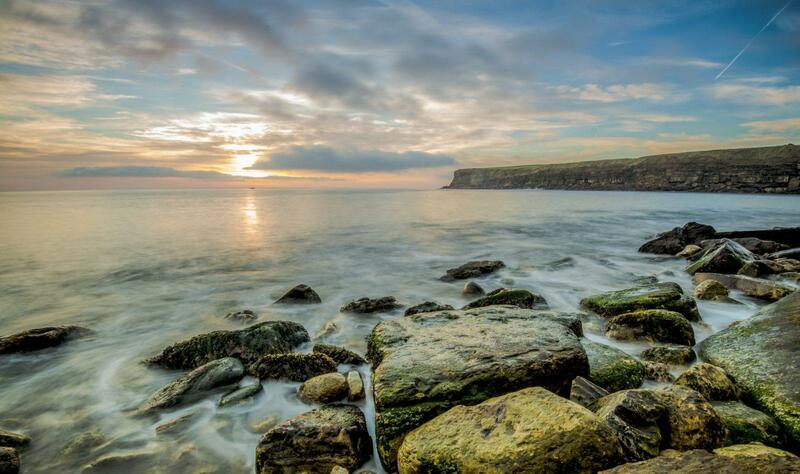 Those lucky enough to have holidayed in Filey in the past will be well acquainted with the wonderful, friendly attitude of the locals who make it one of the best places to visit in Yorkshire. Perhaps one of the most photographed places in Yorkshire, Robin Hood’s Bay is a traditional fishing town which is as unique as it is beautiful. It’s just 15 miles from Whitby, so both could be enjoyed in a single day. 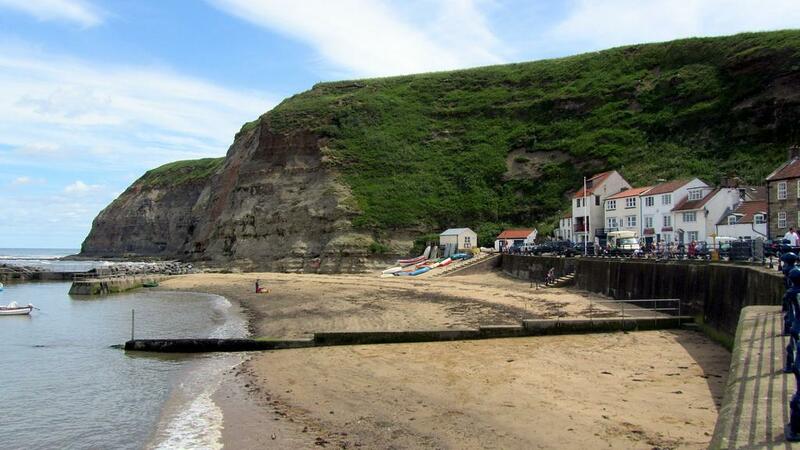 Although the beach is relatively small, its surroundings make it one of the most charming locations in Yorkshire. 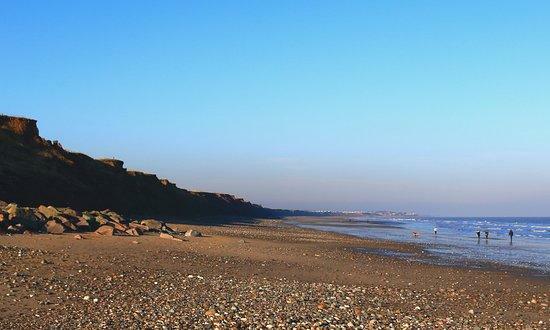 Located in front of the village of Mappleton and around 3 miles from Hornsea, Mappleton Beach is home to the fastest eroding cliffs in Europe – great for fossil finding! The beach itself is sandy and normally fairly quiet as the usual seaside attractions cannot be found here. However, there’s a free car park and lovely little tea rooms nearby. This beach is great for a romantic evening walk or for exercising your four-legged friend. 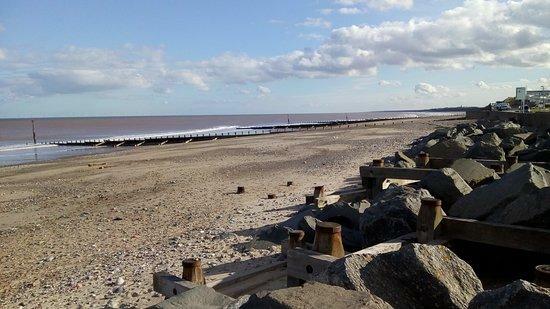 Hornsea is great for a family day out. The beach is long and sandy and the promenade is lined with all the fun attractions you would expect to find at a British seaside resort. This coastal town has been a popular seaside retreat for UK holidaymakers since the Victorian era and people still flock here to enjoy scenic walks and watersports. Sandsend is a picturesque village near the popular coastal town of Whitby. 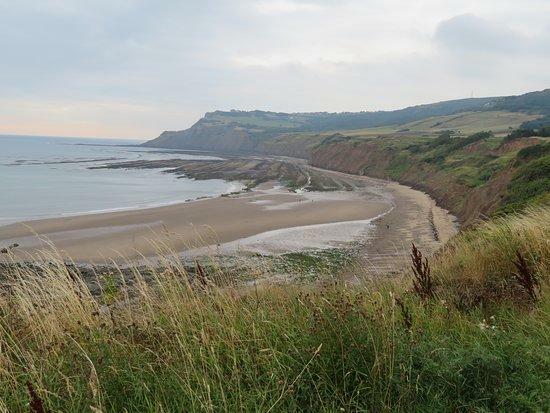 In fact, the sand & shingle beach stretches all the way to Whitby and it’s just a 3.5 mile walk to get there and back. There isn’t a great deal to do nearby but what it lacks in entertainment, it sure makes up for with its pretty views of the ruins of Whitby Abbey. You’ll find a cafe and a pub close to Sandsend beach if you fancy a spot of lunch. Runswick Bay is absolutely one of the prettiest villages on the Yorkshire coast. 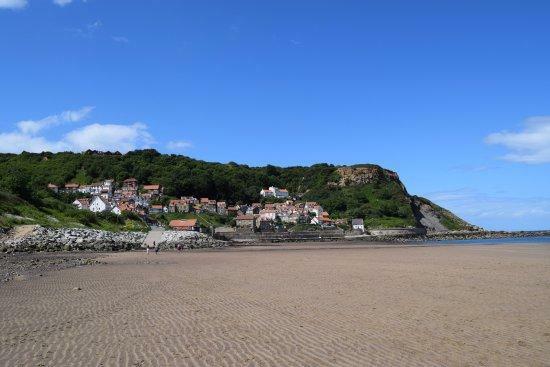 Located about 5 miles north of Whitby, Runswick Bay boasts a beautiful sandy beach and a coastline dotted with picturesque red-roofed cottages. It really is a stunning little place and very popular with holidaymakers. Enjoy a traditional day on the golden sand building sandcastles and dipping your toes in the sea, before visiting one of the excellent cafes for cake and cuppa! Saltburn beach has been a popular tourist destination since Victorian times. The sand and shingle beach is backed by your typical seaside promenade with plenty to see and do. You’ll see lots of Victorian inspired ironwork and architecture during your visit and the formal Italian Gardens with miniature railway are well worth perusing. 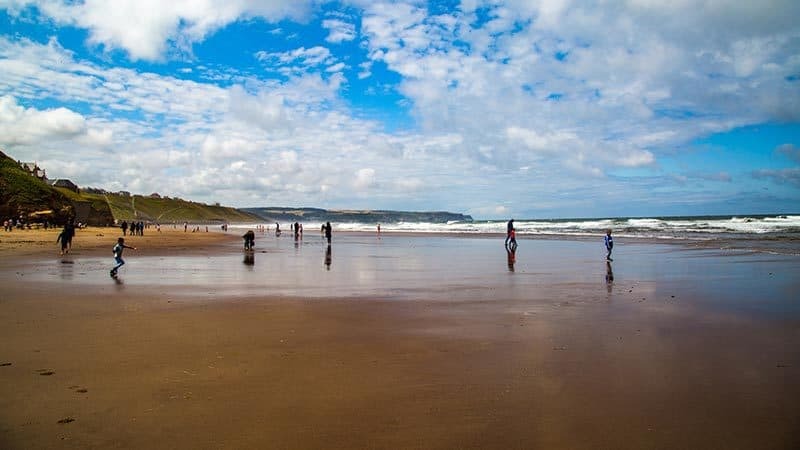 This is one of the best spots for watersports on this stretch of coastline so if surfing is your thing, Saltburn beach should certainly be on your list of places to visit! 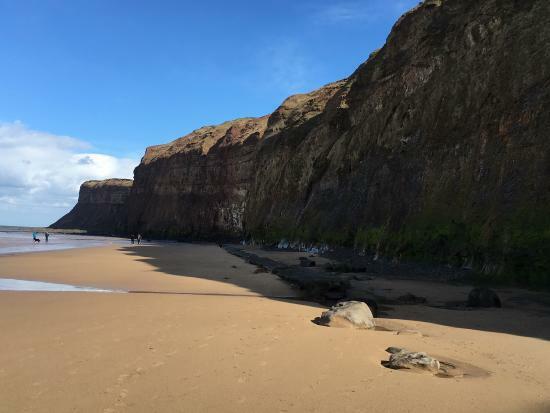 The small sandy beach at the picturesque fishing village of Staithes is immensely popular with fossil hunters as this stretch of coast is often referred to as ‘Dinosaur Coast’. The beach and the village are both incredibly pretty and the harbour has been featured in many television programmes in recent years. The water at Staithes Beach, however, isn’t the best quality so it’s probably best to avoid dipping anything other than your toes in it! Despite the mucky water, the beach is still pleasant for sunbathing and casual strolls with the pooch. 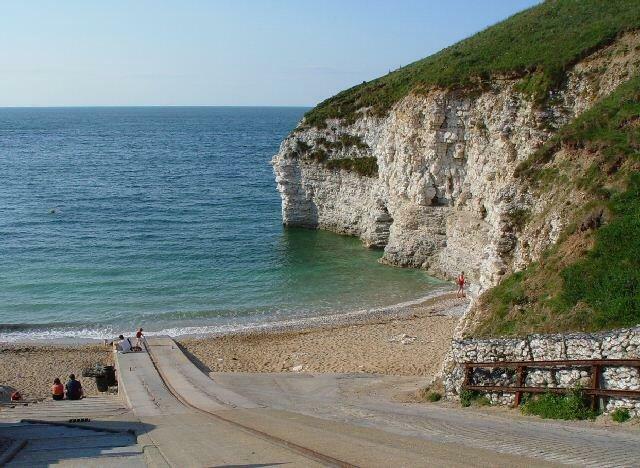 Surrounded by beautiful chalky white cliffs, Flamborough Beach is a combination of soft golden sand and small pebbles. It’s a lovely little beach in a natural cove. Scattered with rock pools, it’s great for hunting small marine life at low tide. Access to the beach is at the nearby car park, where you will also find toilets and a cafe. This part of the Yorkshire coast is great for bird spotting as kittiwakes, razorbills and even puffins can often be seen in the area. 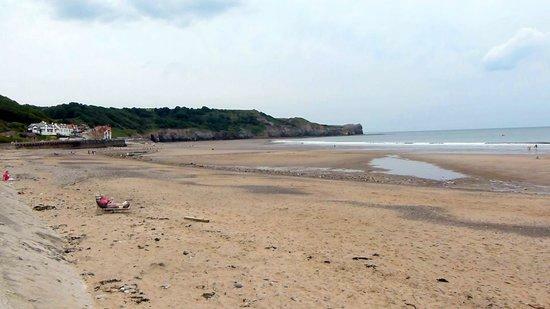 Do you have a favourite Yorkshire beach? We’d love to see your holiday snaps!